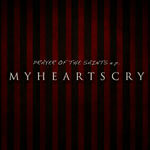 For an independent band, My Heart's Cry seem to be making quite a name for themselves. In the several years they've been making music, they've shared the stage with significant talent such as Project 86, John Reuben and Bradley Hathaway. They've also played big festivals (including the Christian mega festival Cornerstone) and played at Six Flags amusement parks. It's all because of their catchy tunes, which they present to us in 2011 via the EP Prayer of the Saints. The opening song is called "Stronger." It's a driving rock track that makes use of some piano in the verses and some strong guitar riffs to take control of the chorus. The vocals that open the song are slightly annoying, but they work better throughout the rest of the song. It's a defensive song, with the vocalist, Jeff Hamm, claiming that he's going to stand strong and not be pushed around. "Crazy" follows, a pop punk song with some addictive synth in the verses. It's pretty fast paced, but the heaviness is toned down from the previous track. So far, they seem to be somewhat versatile in their style while staying within the realms of upbeat rock music. The next track, though, called "Prayer of the Saints," is a much slower piano ballad. It takes a very positive view on life, even the negative things like loneliness and the sin that separates us from God. It does pick up some rock traits near the end, but the majority of it keeps rather quiet musically. The song doesn't lend itself to the most creative of lyrics, but the message is a good one, and it's rather inspiring. "Unworthy" picks it back up, but is a song that is almost half-piano-ballad and half-rock-song. It's one of the top tracks on Prayer of the Saints. If someone asked what My Heart's Cry sounded like, this is probably the song I would recommend. It's a little bit of everything that makes the band who they are, musically and lyrically. They follow it up with "Stay With Me." Another rock track, with a bit more intensity in the vocals than what we've been used to thus far. The final song is "Summer Romance" and it rarely slows down. The verses are just as energetic, if not more so, as the chorus. It takes the EP out on a good note, with some fun and well-played music and possibly the best lyrics of all six songs on the collection. After listening to Prayer of the Saints, it's not too difficult to see why they've been given so much attention. The band's bio talks about the uniqueness of the music, and while I have to pretty much disagree with that completely, their talent is not lost in it. Be on the lookout for these guys making bigger waves in the Christian pop rock arena, as they definitely have the potential to make it, sitting up there amongst the likes of Remedy Drive and Danyew.